This past week, Craig Venter told the New Scientist that “Race-based medicine doesn’t have any real basis in science.” I have no idea why this story seems to be of little interest to the majority of science journalists, as it has not been very widely reported, but it represents a major milestone in terms of understanding how humans vary biologically. The story stems from a comparison of Venter’s genome with that of DNA co-discoverer, James Watson. Venter, who loves both competition and controversy, has set himself apart not only from Watson, whose shameful remarks about the intellectual inferiority of Africans severely tarnished his reputation, but also from his old foe, Francis Collins. Venter was the CEO of Celera Genomics when Collins was the director of the National Institutes of Health’s National Human Genome Research Institute. Both Venter and Collins desperately wanted to be the first to decode the genome as part of the Human Genome Project. Despite Collins’ subsequent arguments against the race concept, when the announcement was made in June 2000 that the Human Genome Project had completed an initial decoding of the DNA strand, he stated that the project researchers had used the genes of five different people, representing the major races of humans, and the racial diversity of humans. Even at that time, this seemed to me to be a confusingly narrow view of human population biology. 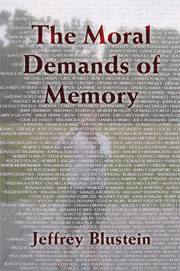 Cover from Jeffrey Blustein's The Moral Demands of Memory. Cognitive scientist, public intellectual, and (more importantly) inspirational member of the Luxuriant Flowing Hair Club for Scientists Steve Pinker has a piece of interest out in The New Republic, May 28th, 2008, “The Stupidity of Dignity“, which some What Sorters will find of interest. It concerns the use of the concept dignity in thinking on public policy in the realm of technology, enhancement, and human futures, and responds to the President’s Council on Bioethics recent release of a 555-page report, entitled Human Dignity and Bioethics, out in March 2008, and whose table of contents you can find here. There will be many places on the web that you will be able to find discussions of this, in due course. Hat tip to The Neurocritic for catching my eye, who in turn picked it up from Jason Rosenhouse’s EvolutionBlog . What Sorts of Death Do We Choose? VP-Net looks at palliative care, euthanasia, and other end-of-life issues as they are applied to people with disabilities. The website is in its early stages but the site provides a quick way of getting acquainted with the project. The Department of Homeland Security, the Centers for Disease Control and Prevention and the Department of Health and Human Services were among the groups represented on Task Force preparing the recommendations on Pandemic preparedness published in the MAy 5, 2208 issue of CHEST, the official publication of the American College of Chest Physicians. The recommendations are intended to ensure that health care providers follow a common set of criteria in deciding who gets life-sustaining treatment when a pandemic arrives. Among those lives to be sacrificed for the greater good are those with severe mental impairments and severe chronic illness. While the guidelines do not include names or pictures of the individuals presumably cast out of Kohlberg’s lifeboat, it is pretty clear that many people with significant disabilities will be left to sink in or swim on their own in some very rough seas. These guidelines suggest that even before a clear shortage of medical resources is identified, available resources may be denied to people with disabilities on the chance that someone “more worthy of saving” might require them later.